For quality purposes we add a new person to our project. The problems found will be documented for future reference. Here is the first problem. LoginPortal.Web.csproj : error : The Web Application Project LoginPortal.Web is configured to use IIS. Unable to access the IIS metabase. You do not have sufficient privilege to access IIS web sites on your machine. 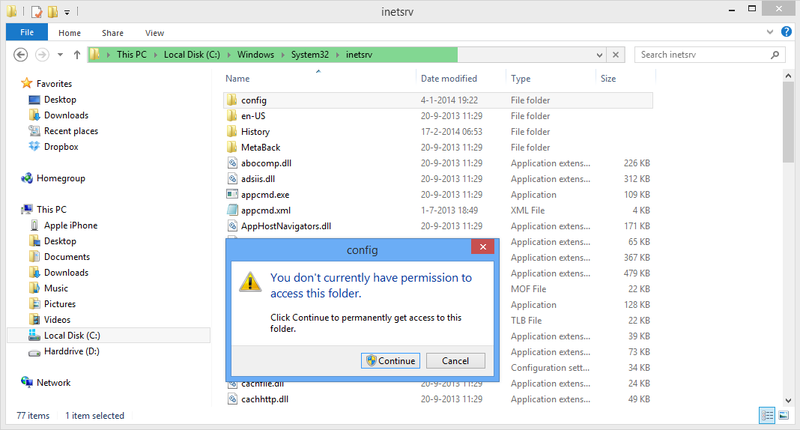 The solution (windows 8.1) is to grant access to the %SYSTEMROOT%\System32\inetsrv\config folder by browsing to it. This entry was posted in Development and tagged iis, metabase, newby, quality, Security, visual studio, Windows 8.1. Bookmark the permalink. Thanks for this. Ran into a very similar problem and this solved it. Otherwise I was going to need to spend a day uninstalling and re-installing everything on our build box in order and I did not look forward to it! Thank you, Eric. You made my day. My inetsrv folder is empty. This solution cannot be done. Are you using IIS or IISExpress?